Preamps are the heart and soul of the recording signal chain, and the two-channel PreSonus ADL 600 delivers a near-perfect combination of sound quality and features that justify its use in any professional studio. Designed by renowned tube circuit designer Anthony DiMaria of Anthony DiMaria Labs, but built with the manufacturing expertise of PreSonus, the ADL 600 is priced within easy reach of any pro studio. With tons of headroom, a big, open sound, and great control ergonomics, the ADL 600 scored high praise for everything we threw at it. It doesn’t hurt that some Grammy-winning engineers and producers we’ve been working with recently loved the sound of our recordings through it, either! If you’re looking for one studio preamp that can easily become your go-to preamp — one that delivers great, reliable results from any audio you throw at it, nobody will fault you for starting and ending your preamp search with the ADL 600. PreSonus is widely regarded for building value-packed recording products that are quite popular in the project studio and home studio worlds, and now they’ve brought their value proposition to the big studio world; no small feat considering that the ADL 600 is hand-built in the USA! The PreSonus ADL 600 is a beautiful preamp to behold, wrapped in a brushed black finish with cool blue LEDs, and we were excited to discover that its beauty was far more than skin deep. 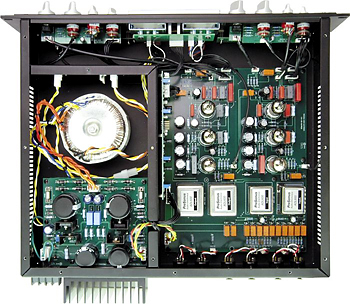 Inside the hand-built (in the USA) ADL 600 is a two-channel, class A microphone preamplifer that uses three mil-spec vacuum tubes on each channel. Frequency response covers 10Hz to 45KHz, and the ADL600 has 30dB of headroom, making it easy to record sources from the loudest of instruments (up to +73dB) down to the subtlest nuances of a quiet acoustic source. Capturing those soft audio sources requires a quiet preamp, and the signal-to-noise ratio in the preamp is -100dB. The ADL600 can accommodate a wide range of audio sources. The rear of the ADL600 has XLR connectors for both line level and mic level inputs on each channel, and the front panel has two quarter-inch TRS jacks that override the rear connections when in use. This is especially useful for connecting random instruments in your control room, whether you need to overdub a keyboard synth or track some guitars connected to an amp-modeling package in your computer DAW. Input impedance is variable, which not only makes it easier to set appropriate signal levels for a given audio source, but it also enables you to creatively apply impedance mismatches to achieve various effects. Many notable engineers created classic vocal sounds by purposely mismatching the impedance between microphones and preamps, and with predefined selectable values of 1500, 900, 300, and 150 ohms, there is plenty of room for experimentation. Each channel features an identical array of controls. 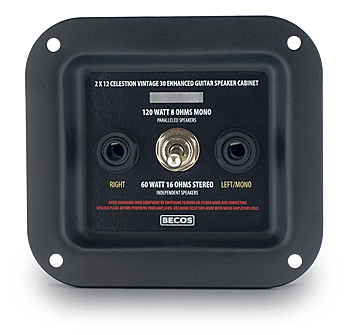 Detented knobs let you set gain (up to 35dB) in 5dB increments, while Trim knobs provide +/- 10dB adjustment to fine tune the levels, or to ride them while tracking if needed. A defeat-able high pass filter on each channel can be set to 40Hz, 80Hz, or 120Hz, and when enabled provides 12dB of reduction. 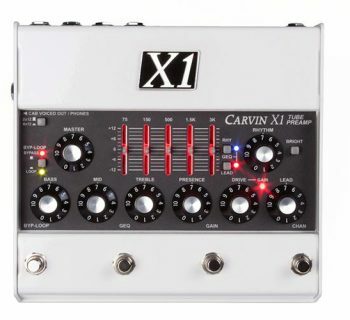 Additionally, each channel has a -20dB pad, selectable 48V phantom power, and polarity invert. Metering is handled by both analog VU meters and a set of eight-segment LEDs providing the best of both worlds: VU meters for observing general levels and LEDs that make it easy to catch fast transients that may clip your audio signal. If you’re recording a constantly loud audio source, a -6dB pad for the VU meters reduces the level being displayed so that you can observe actual variances in the signal. The digital metering remains unchanged so that you can easily spot clipping. The first seven LED segments are blue, while the final segment is red. We would love to see a future revision to the ADL 600 add one or two features: First, we are almost desperate for the inclusion of some inserts. We would love to throw a compressor into the signal chain before it hits the outputs. Second, we’d love it if the ADL600 supported an optional digital i/o card to directly attach this preamp to various DAWs. This would make the preamp more useful to small project studios that may otherwise lack the budget for dedicated A/D converters. But other than these requests, we really couldn’t ask for more! The PreSonus ADL600 was a dream to work with thanks to a user interface that was extremely well thought out and implemented. Hooking up the ADL 600 was a simple task: just a few XLR cables in and out of our patch bay had us connected and recording tracks in a matter of minutes. The metal switches all had a very solid throw, and the gain controls had crisp detents for easily matching levels on both sides of the preamp. The Trim controls on each channel had a very smooth touch that provided just enough resistance (and size) for us to easily ride levels while tracking passages with extreme dynamics that we didn’t want to squash with compression. 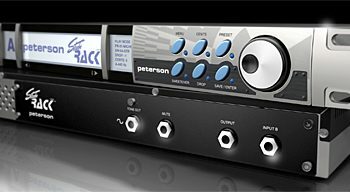 We loved the way that PreSonus implemented a dual metering solution. The LEDs helped us catch peaks that we never would have caught relying only on the VU meters, and the -6dB VU meter pad made the VUs much more useful to observe while tracking. When using the front-panel line inputs, the phantom power, -20dB signal pad, and impedance controls were automatically bypassed. We found these inputs extremely useful for randomly recording some keyboard and guitar parts from our control room. 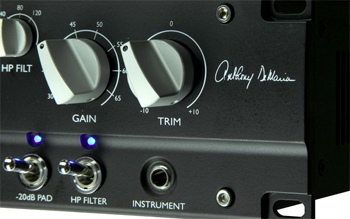 If there were only one preamp in your studio, the PreSonus ADL 600 would be a respectable choice. This is the stuff that great preamps are made of, and if you’re looking for a great preamp that makes everything it touches sound fantastic, the ADL 600 would be as good a choice as any other widely-known studio alternative. We ran the outputs of our ADL 600 into an Apogee Rosetta 800 A/D converter and from there into a Digidesign 002r via the ADAT Lightpipe interface. Over the past few months, we recorded hundreds of tracks worth of electric guitars, acoustic guitars, keyboards, vocals, and percussion. In fact, we loved the sound of this preamp so much that we made extensive use of the ADL 600 while tracking a full-length album with legendary rock producer, Ron Nevison. 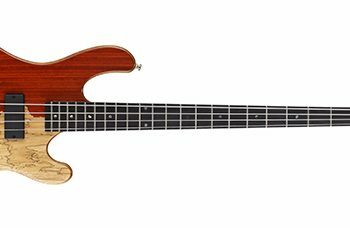 Describing the sound of any preamp is about as challenging as you can get — talk about subjective! But the ADL 600 managed to deliver extremely transparent yet rich sounding recordings with a nice, open top end that really let our instruments shine, no doubt in part due to the big headroom. Our Martin and Taylor acoustic guitars rang through with all of their brilliance and subtle overtones, and a wide range of electric guitars and numerous tube amps came through with a commanding presence. We used the front panel TRS inputs to record some synthesizer parts from a Roland synthesizer, and they were captured beautifully with no added noise whatsoever. We also connected an Ibanez electric guitar through the front panel in order to track a few parts using IK Multimedia’s AmpliTube 2 and had great results with this as well. Testing the preamp’s extreme gain capabilities, we recorded some sound effects — the ticking of a kitchen timer that was especially quiet compared to any typical instrument source, and we achieved very clean results. Really, everything we ran through the ADL 600 sounded great. It delivered a well-balanced sound that didn’t make our guitar tube amps sound too mushy and it let digital instruments come through with sonic purity. We have no doubt that the ADL 600 is destined to become a modern classic, and it has became one of our daily go-to studio pieces. The documentation was short and sweet. PreSonus has a history of delivering fine product documentation, and the ADL 600’s documentation carried on that tradition. Despite only really needing to refer to the documentation for a few questions about metering levels, etc., it simply described all settings, a variety of ways to patch the preamp in the studio, and it also included various suggested applications. One use that hadn’t occurred to us, for example, was to run the master output from our DAW through the preamp to add some tube warmth to the overall mix. The PreSonus ADL 600 (MSRP $2,699) sells for approximately $2,200. This is a very good price that places it solidly in line with other studio-class tube-driven, two-channel microphone preamps. If you’re looking for a top-flight preamp that doesn’t sound exactly like the same old preamps in everyone else’s studio, make some hit records with this one before every studio has a few of these in the racks.